One of the UK’s few remaining chain (or cable) ferry crossings has seen a major reinvestment, undertaken as part of an infrastructural development and local regeneration scheme. The new embodiment of the Floating Bridge, the collective name for the vessel and route which connects Cowes and East Cowes on the Isle of Wight, is a 37m chain ferry offering increased carrying capacity and efficiency than the previous, 41 year-old vessel (see Ship & Boat International July/August 2016, pages 70-71). Constructed by Mainstay Marine at Pembroke Dock in west Wales, the £3.2 million (US$4.15 million) replacement Floating Bridge has been funded by the Isle of Wight Council and the Solent Local Enterprise Partnership. Burness Corlett Three Quays (BCTQ) was retained to develop the design. Chain ferries constitute one area of the company’s broad experience and portfolio of specialised vessel projects. Provisionally named Floating Bridge No.6, the ferry is of drive-through configuration, with hydraulically operated loading and unloading ramps at each end. Whereas the previous ferry took 15 cars/vehicles in three lanes, the new Floating Bridge accommodates 20 cars in four lanes, with the passenger spaces and wheelhouse forming the superstructure along one side. Additional space is provided for stowage of motorbikes, scooters and bicycles. The drive wheels for engaging with the chain are located in the underdeck space. 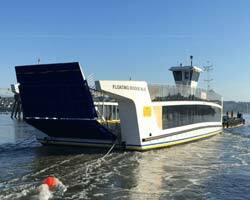 The ferry is capable of making up to 5knots on a total deadweight of 53tonnes. The engine and control room air intake solution was provided by Veotec. The system, incorporating proprietary two-stage filtration combined with an electronically actuated and failsafe, integrated airflow damper, ensures incoming combustion and cooling air at the requisite temperatures and purity, free of moisture and salt. The ferry has been designed with extensive use of glass in the upperworks. Seaglaze Marine Windows of Norwich supplied all the glass requirements, utilising sister company Specialist Toughened Glass (STG), which produced the laminated sections and CNC-machined panes.The Cowes Floating Bridge is classed in accordance with Bureau Veritas’ Inland Navigation Vessel rules, and is subject to rigorous annual inspection by the UK’s Maritime & Coastguard Agency (MCA). In preparation for the vessel’s arrival, it was necessary to partially reconstruct both of the chain pits in Bridge Square, East Cowes. Each pit houses a 3.5tonne weight, attached to the end of each chain to counterbalance the weight of the chain itself. The ferry was connected to the chains during the neap tide period of early May and brought into service following tests, commissioning and staff training. Following entry into service, problems were encountered when berthing at low states of the tide. It was decided to add longer ‘fingers’ to the prows at each end of the vessel. The work was scheduled for July and is intended to reduce the angle at which vehicles embark/disembark from and to the concrete ramps, thereby improving access and egress. The Floating Bridge is one of seven remaining chain or cable ferry routes in the UK, all others having been supplanted by fixed bridges. It operates 365 days a year, for approximately 18 hours each day. The short passage across the mouth of the River Medina is made in just a few minutes, at intervals of 10-15 minutes. The alternative road route between Cowes and East Cowes entails a 10-mile detour via Newport. Established in 1859, the service has been owned and operated by the island’s local authority since 1901. Annual carryings are in the order of 1.5m pedestrians and 400,000 vehicles.